Bring positivity and beauty to your front yard, back yard, or other landscape with these 9 feng shui cures for outdoor spaces. Feng shui is all about good vibes. As you may know, in feng shui, the word for vibes (actually life force energy) is chi. Naturally, one of the most important feng shui considerations is choosing a place to live where the very land itself possesses positive chi, and then increasing the positive chi quotient as much as possible. But if where you live doesn’t have particularly vibrant chi, one of your most important feng shui considerations would be to shift that condition. When it comes to increasing the positive chi on actual plot of land where you live (or just around the outside of your apartment), consider the following outdoor chi-enhancers. 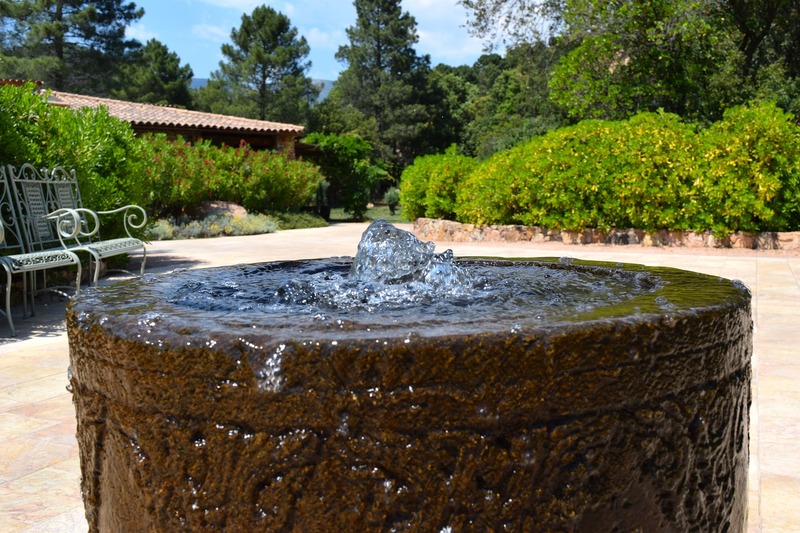 Fountains and waterfalls generate negative ions (which are actually positive vibes) while imparting a feeling of lushness, vibrancy, luxury, and health. Birdbaths are not only great feng shui additions to your yard, they’re also great alternatives to fountains for smaller spaces or places without electricity. Not only do they draw lush water energy, they also draw our feathery friends, who also increase the chi! If you’d like to throw some negative ions into the mix, and just to keep the water fresh, you might try a solar powered water wiggler. And, if you’re in an apartment with limited space in the front, you might try a hanging bird bath. Bird feeders also draw our fine feathered friends and air spirits who empower our outdoor areas with happy bird songs and vibrant life. Vibrant, happy outdoor life = good outdoor feng shui. Of course, healthy plants are the tried-and-true remedies to outdoor areas that can use a bit more positive chi, especially when they feel lush and friendly (avoid the cacti and otherwise harshly spiky plants). Wherever you can add beautiful flowers, do it! Flowers contribute to excellent outdoor feng shui by adding their fragrance, color, and unique magical properties into the mix. Wind chimes will bless your outdoor feng shui with beautiful, cleansing, uplifting, enchanting energy. Just make sure you choose ones with a sound you adore. Light-reflecting mobiles will brighten your outdoor feng shui with beauty, whimsy, and movement. Invisible blessings such as prayers, invocations, and intentions should not be overlooked when it comes to outdoor feng shui. For example, if you live in a big apartment building with no freedom to add things to the outdoor areas, you can still connect with the spirit of the land. Visualize the natural area the way it was before humans built anything on it, and honor that space by acknowledging it as sacred. Or, you could simply ask the Divine/God/Goddess/All That Is to bless the space with vibrant chi, and then envision a sphere of glowing white or emerald green light completely surrounding and encompassing the area where you live. P.S. Want to learn to feng shui like a pro? Check out my Total DIY Feng Shui Series! Did you feng shui your yard or outdoor space with any of these tips? How did it go? Please share in the comments. I found your blog very interesting. all information is very useful for me..